It's the 2nd, and I failed at my blogging duties. I'm meant to post Starting Sparks on the 1st. I didn't. Here in Britain the storms are a-blowing, but no matter the hail and wind, the weather cannot take away the daylight. The days are lengthening, and my soul is singing! I had an English exam yesterday. I think it went well. At least, I wrote two very passionate essays and quite enjoyed myself. I finished The Silkworm by JK Rowling. I LOVED IT SO MUCH. I can't even tell you. I've started reading Les Mis! Sometimes I forget how attractive Hugh Jackman is. He's about three decades older than me, it's definitely not appropriate but ... definitely true. I was really feeling the desperate need for a nineteenth century novel, which is not a sentence I ever thought I'd type, but it's true. I'd not read one since Northanger Abbey in, like, August. It was too long! Les Mis is very beautiful and good. I'm enjoying singing the songs in my head as they come up. Starting Sparks is a monthly link-up for writers at all stages, hosted by Ashley and me. We post a prompt on the 1st of each month (or sometimes occasionally the 2nd) and you respond however you'd like! Last month we had a whole FIVE linkers not including us -- a new record. I'm really excited! I'm not sure what form this prompt is going to take for me. I guess the idea is that you use your novel characters for a fairytale, but if you don't have novel characters -- that is if you're not writing a novel -- don't let that put you off! You can just rewrite a fairytale. 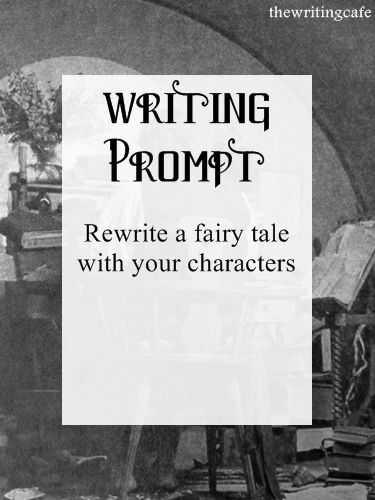 Or write a story inspired by a fairytale. Or whatever the heck you like. We're just here to start your sparks, and let them flame where they may! I don't actually know who he is! I always use gifs and people comment like "love the [insert fandom here] gif!" and I'm like dang I don't actually know where it's from ... oops! Les Mis is the besttttt. That book <3 I hope you enjoy it! I LOVE IT! So much, actually, it's beautiful. YES AND YES. It's my favourite thing ever. The music is objectively perfect, and the book is dang good so far. I know, FIVE whole linkers! Isn't it glorious! Let's see how this goes now, hm? I happen to like the idea. Right?! I like it also. Mermaids, I think! Hmmm, this is interesting. I shall have to link up this time!! I've got a couple of ideas...one involves tv characters and the other one of my own fractured fairy tales. PS I haven't read your Jan story yet but I WILL SOON! CAN WE JUST FANGIRL OVER THE SILKWORM TOGETHER ?! It's so underrated and so great. The series just keeps getting better, in my humble opinion. That's all I wanted to say. Great post! ADS;LGKJ;ASKLDJG YES WE CAN! I loved it! Love Strike! Love Robin! Love London! Love snow! Love the literary world! Love the themes and motifs and epigraphs and cleverness with names! LOVE! IT! I finally did it, I've been meaning to join this link up since it started. Took forever! I do enjoy the mammoth books! It's actually wonderful. I love it!